2016 October | Was Mom Wrong? True or False: Resistance training can help you lose weight? Let’s tackle the question of whether engaging in resistance training can help you lose weight. 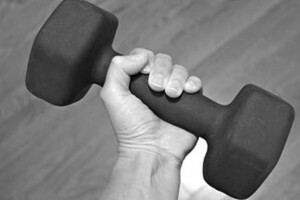 Many of us have heard fitness professionals say that lifting weights will help you shed pounds. But when you think about it, a natural assumption might be that lifting weights would cause you to gain weight because you’re strengthening and building muscle. The truth is that performing resistance-training exercises can indeed help you lose weight. There are a number of reasons why this is the case. 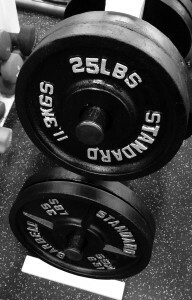 Lifting weights burns calories. The number of calories burned while doing biceps curls, push-ups, squats or resistance-band exercises depends on a number of factors, including the intensity of the lifting session and how many sets and repetitions are performed. On average, we burn from 200– 500 calories an hour lifting weights. If you are lifting 3–4 times a week, those calories can really add up. Our metabolism elevates slightly when we lift weights. Following our lifting session, our metabolism doesn’t immediately drop to what its baseline level was prior to hitting the gym; it can stay elevated for minutes or even hours afterward. This phenomenon known as EPOC—excess post-exercise oxygen consumption—results in a slightly increased rate of oxygen update after exercise as the body works to restore hormonal balance and replenish fuel stores. You burn additional calories during this recovery process. The more intense the workout, the longer your metabolism will stay elevated and the more calories you will burn. Muscle is metabolically active tissue; each pound of muscle we have burns about 20 calories a day at rest. Considering that after age 30 we lose from 5–10% of our muscle mass per decade, you can see how maintaining the muscle mass we have—or adding to it a bit by resistance training—could help with weight maintenance over our lifetime. Kirk, E., Donnelly, J., Smith, B., Honas, J., Lecheminant, J., Bailey, B., Jacobsen, D., and Washburn, R. Minimal resistance training improves daily energy expenditure and fat oxidation. Medicine & Science in Sports & Exercise (2009), Vol 41, pp. 1122-1129.